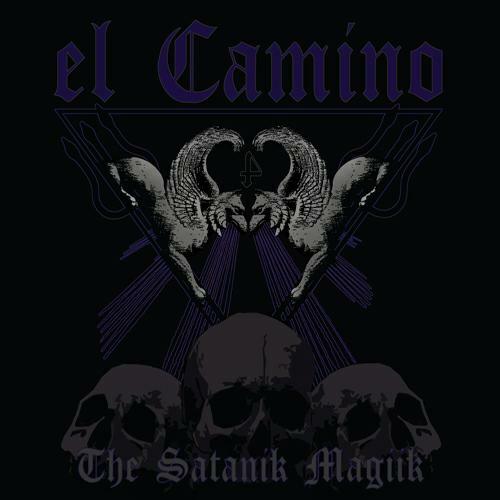 El Camino - "The Satanic Magick"
El Camino are a new Swedish band playing doomy stoner rock. This CD/LP features 8 tracks in 45 minutes. The opening instrumental number, Prelude to the Horns, is very doomy to start with a huge sound to start and then into a more stoner rock groove the next 2 1/2 minutes. Hail to the Horns follows for the next 6 minutes with some more monster riffing and now you get to hear the singer, who has a very growly singing style. The next section the guitar players each take solos (too short) and then back into the main riff and singing. The track is pretty intense and then a doomy ending. We are the Dark is doomy to start and then the slow building riff starts to take off. Around 3 minutes the track gets a bit spacey as it slows down. The band then takes it back up into a groove. The solo section was a bit weak though. Mountain Man is the most melodic track so far and a slow stoner rock style track with some cool parts. Intense end! Rise of the Snake has some dual harmony guitars at the beginning and then kicks into the main riff. I was never really struck by this song. This is one of the weakest songs on the record. Family Values is another track over 6 minutess and starting a bit more doomy. A very Black Sabbath inspired one! He sings some pretty heavy lyrics in this song, based on the title. The solo guitar section is pretty cool on this one before the singing kicks back in and the heavy groove. The title track (been used by a lot of bands) is the longest on the CD at 8 minutes. The singer is very intense and they have a vocal sample of some sort before the guitar solo section which is the best on the record. Nice solo and the space guitar at the end was excellent. Abra Kahdabra ends the record and is the shortest track which starts with a strange backwards static vocal thing that is pretty strange and the music fades in and out with this intense voice on the top and also includes some backwards stuff that morphs in and out. Far out ending. I loved it. El Camino is a pretty intense band. The singer is really in your face and forceful. Some of the band's songs are great and lots of amazing riffs. The band is a bit weak in the guitar soloing but they have nice part changes and some good harmonies at times. I still am mixed on this record. Some days it blows me away and sometimes not. You decide.